Violets are one of my most favorite of all flowers - right up there with roses and lilacs! When I lived in Iowa, I loved how violets covered the lawns in spring time - enough that I was able to pick enough blossoms to make violet syrup for the first time! In Colorado, violets don't always do well. The summers are too hot and dry and the winter too uneven in temps to allow them to thrive. 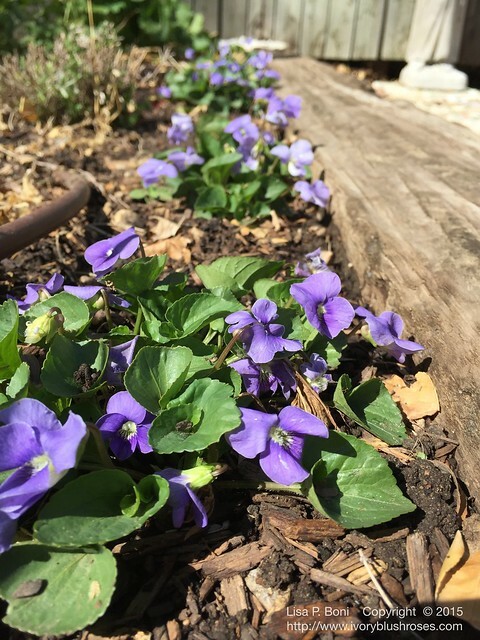 Last spring, just before tearing out the old flagstone patio, my daughter and I discovered a few small violet plants blooming among the flagstones. 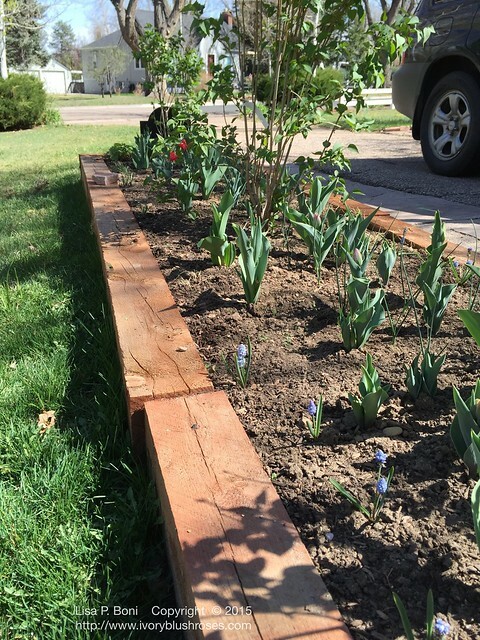 We tenderly dug them up and transplanted them into the large flowerbeds in the side yard. Most of the summer they looked rather forlorn. I really wasn't sure they would survive the summer, much less the winter. 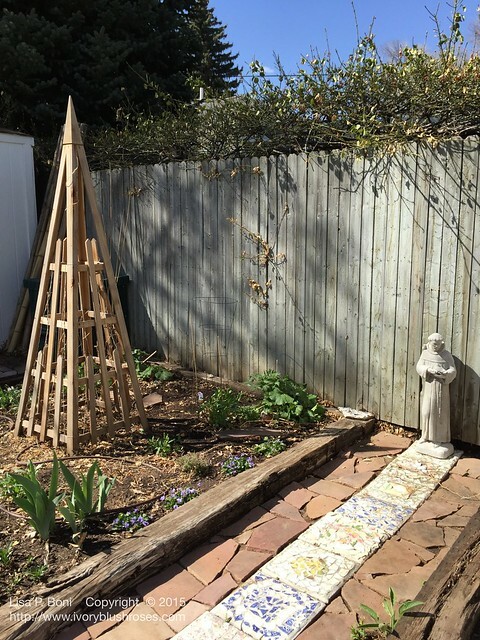 Today, taking advantage of a beautiful day, I decided to catch up on some garden work, namely clearing out the side gardens to prepare them for spring and summer. What a delight to discover that not only had the violets survived the winter, but they were thriving and blooming like crazy! Such big glorious blossoms! I am in heaven! The violets are on each side of the garden path - they don't really show up from a distance - but I know they are there and it makes my heart glad! After clearing out a huge pile of old stalks and leaves from last year's gardens, all the freshly growing plants have space to grow! It's time to get the sweet peas planted around the tuteurs! Last year I got them in far to late and they never did much, though the morning glories were fabulous! 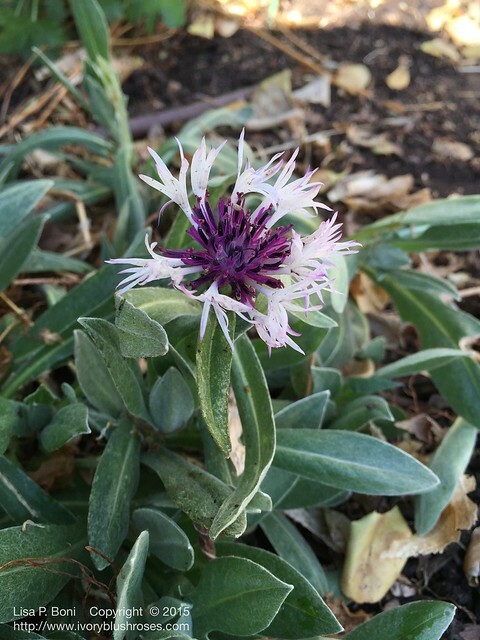 I found another surprise when I cleaned things up - a blossom on the Centaurea Montana (Perennial Bachelor Button). The variety is Amethyst in Snow. It didn't bloom last year, but looks like it's off to a fabulous start this year! 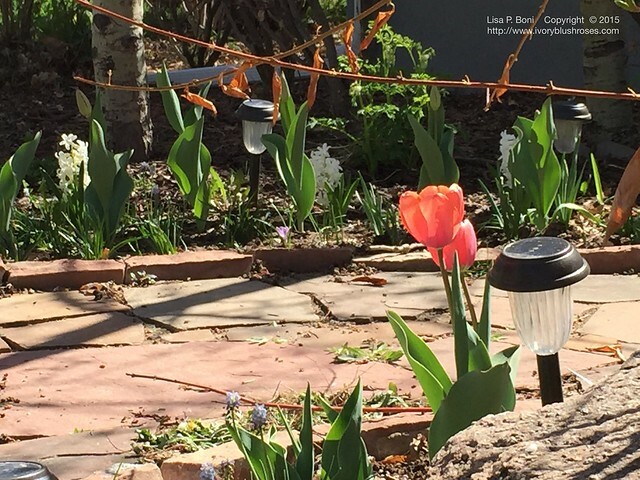 All the bulbs I planted last fall are coming up along the flagstone walk by the driveway! I've been weeding a bit, so it's not terribly neat at the moment. The Apricot Blush tulips are pretty orange! Soon, the brown forsythia branches above them will be bursting into bloom! Maybe then the old leaves left from last year will finally drop off! 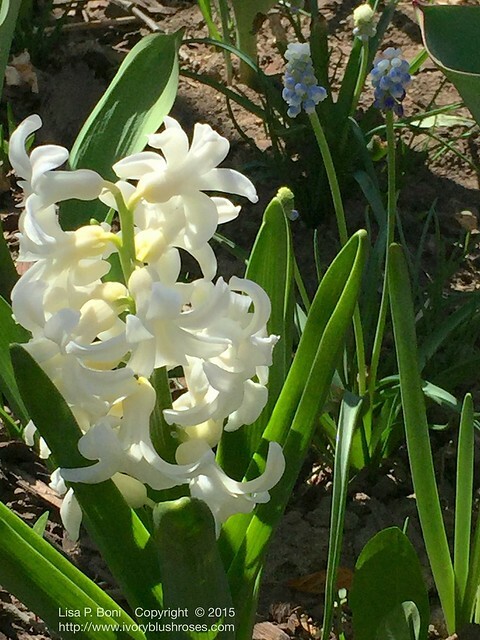 A closer look at some of the hyacinths along the flagstone walk. I love the large fragrant hyacinths! 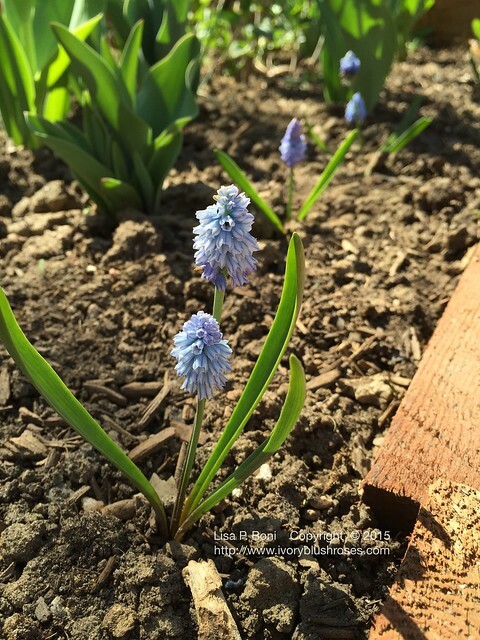 I also enjoy Grape Hyacinths and planted an assortment of pale blue and white varieties on this side of the house. The front walk is lined with the old fashioned purple spreading variety. The bed along the driveway is coming up as well! A few tiny crocus, a different variety of pale blue grape hyacinth (seen up close below), several varieties of tulips and some allium that will bloom later. One of the lilacs actually has blossoms on it this year! I wasn't expecting any for another two or three years! Loving these pale blue beauties! I can imagine what this bed will look like in a few years as these multiply! It won't be long until it's time to plant some annuals to fill in the bed for summer. It's a beautiful spring here and I'm so grateful for such a lovely day in the garden! looks like all your hard work last year is really going to pay off this year. It's so nice to see flower - we had snow in NH last week! I work in Boston and walk past a tiny, beautiful garden in an area in the finance district called Post Office Square. Years ago the city tore down a nasty looking old parking garage and replaced it with an underground garage and a gem of a garden. I noticed this morning that there are buds on everything. It's in a protected area, so it's a bit warmer here and things start earlier and last longer. I love walking thru the garden on spring mornings - always something new to see! Thank you for sharing your garden. Ahhhh Spring! Here in Connecticut it is finally warming up. I saw the first blooming crocuses in my garden this morning. They made my heart glad. It has been a long cold winter here in the northeast. Keep pictures of flowers coming for those of us who will not see enough color for days or weeks. Just think how enjoyable it will be to work in your garden this year with all that work behind you from last summer. You are blessed Lisa. 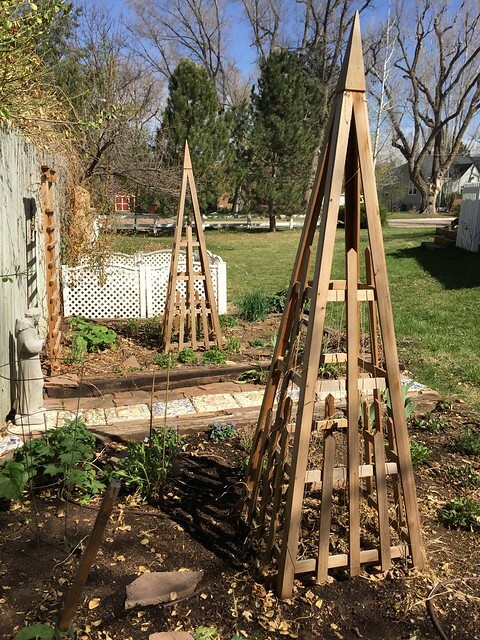 My garden just got rid of the last of the snow last week, and there is nary a bloom or green leaf anywhere yet. So seeing your pictures of blossoms, gives me hope. The Northeast got buried this past winter. Welcome home and boy have I missed your entries. But all worth waiting for. I love the tulips, they are my favorite and I have to investigate beading. I've been watching some of it on CREATE but being a "wannabe" and actually doing it might prove more than I can handle.